Huawei took the stage this morning at MWC, announcing the Huawei Watch 2 and Watch 2 Classic. To sum it up, for anyone that was scared Huawei was completely ditching its stylish Android Wear hardware for something more sporty, don’t worry, the Classic is for you. Let’s talk about the Huawei Watch 2 first, shall we? Sporting a plastic body and rubber straps, the smartwatch features a 1.2″ full circle display, Snapdragon Wear 2100 processor, plus a 420mAh battery powering the unit. The Watch 2 also brings NFC with Android Pay support, an LTE model, and two physical buttons. For the most part, the Watch 2 Classic is the same device, but instead of plastic, it’s metal. While specs and overall design are the same, the Classic will apparently lack LTE connectivity. It has the same 1.2″ circle display and 420mAh battery, though. Huawei also designed a hybrid strap of sorts for the Classic, with one side being leather and other side being a rubbery material. This will help protect your fancy strap from sweat. Additionally, both Huawei Watch 2 models have IP68 certification. Concerning battery life, Huawei states that both should handle 2 days of usage without running dry. On top of that, Huawei is introducing a new mode for the device that will have the battery last up to 25 days, but it does essentially kill most of the “smart” features of the watch. Called “watch mode,” all features except for the clock and step counter will be disabled. Huawei announced that the watches will be available in April here in the US, but no exact word on pricing yet. In other markets, the Watch 2 starts at 329 €, which is around $350 in the US. Thoughts on the Huawei Watch 2? Barcelona, Feb. 26, 2017 – Huawei Consumer Business Group (BG) today defined a new category of wearable technology with the HUAWEI WATCH 2. Using the latest research result and developments from technology innovator Huawei, the watch combines the connectivity of a smartphone, the smarter living applications of a premium smartwatch and the detailed performance coaching and tracking of a leading sports tracking device, all in the form of a stylish classical wristwatch. HUAWEI WATCH 2 inherits the classic design of the original HUAWEI WATCH while introducing new innovations in every category to better empower users’ spirit of exploration and help them enjoy an active lifestyle. The watch will go on sale in Spain, France, Portugal, Italy, Germany and China this March, priced from 329 € depending on the design and features being chosen. It will become available in additional countries including the US, the UK, Russia and Australia from April. For full details on release schedule see notes to editors below. In a world where technology has become more and more integrated into our lives, the HUAWEI WATCH 2 is a product for those who yearn for the freedom to explore while staying connected, without having to be glued to a smartphone. 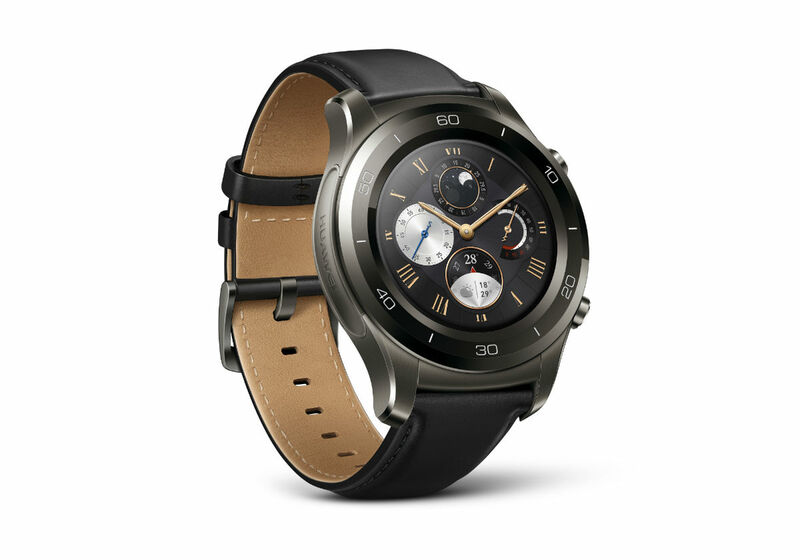 Powered by the Qualcomm® Snapdragon™ Wear 2100 processor HUAWEI WATCH 2 (4G supported version) has independent connectivity, allowing users to send messages or make calls independently of a mobile phone. It also features compatibility for the latest smart living applications. Featuring support for cellular networks and running on the new Android WearTM 2.0 ensures connectivity for both AndroidTM and iOS users and means the HUAWEI WATCH 2 embodies the spirit of openness and exploration for all. With HUAWEI WATCH 2 (4G supported version), users can leave their mobile phone at home and go running, cycling or just exploring while staying connected. Thanks to independent mobile connectivity and a built in GPS chip, users can respond to calls and text messages, use independent apps like Uber, Foursquare and Telegram. The innovative design means that this extra connectivity comes with no sacrifice on quality. VoLTE support and dual-mic noise elimination help ensure a stable and clear telephone experience while the integration of the antennae on the upper watch case for dual 4G, GPS, Wi-Fi, Bluetooth and NFC in the device significantly strengthens connectivity, allowing HUAWEI WATCH 2 to stay compact while ensuring good signal reception. Besides the SIM version working with mobile network carriers worldwide, the HUAWEI WATCH 2 also provides an eSIM version (available to limited countries). What’s more, some carriers feature a one-number-multi-SIM service. There’s no need for a new number, as the watch and your mobile phone can share the same number. Going far beyond being just a partner to a smartphone, the HUAWEI WATCH 2 (4G supported version) provides the flexible connectivity required in a modern active life and gets everything controlled by one hand. HUAWEI WATCH 2 is also a high specification fitness device that uses multiple sensors with advanced algorithms to provide fitness solutions and make working out more efficient and effective. Built-in smart sensors collect comprehensive data on user activity, including distance, speed, steps, heart rate, heart rate range, calories, gait, route and more. With one click on the crown HUAWEI WATCH 2 opens the workout App to start training in an instant. Quick start running modes “fat-burning run” and “cardio run” allow runners to start quickly and the watch will guide your speed to stay in the correct heart rate zone. Running with HUAWEI WATCH 2 enables you to get real time guidance including notifications on distance, target completion status and racing heart warning and based on calculated workout plans, HUAWEI WATCH 2 can also dynamically notify you to either accelerate or decelerate to guide you through every stage of your run. With the support of HUAWEI WATCH 2’s GPS and heart rate detection system, HUAWEI WATCH 2 measures your VO2max after each run. After a valid run the watch automatically generates a report that advises on recovery time and training effects. Other supporting elements include the built in GPS that tracks your exercise route. HUAWEI WATCH 2 also allows you to add music to your workout through the Google PlayTM Music app. Users can download songs, stream music and access their playlists. Beyond just exercise, HUAWEI WATCH 2 promotes healthy living all day. The Daily Tracking App accurately tracks users’ daily steps, record time taken for medium to high intensity exercises, and detect the number of times you stand up after long sedentary periods. All this information is reported via progress bars to encourage a healthier and more active life. Continuous heart rate monitoring tracks your heart rate in the background and reports your heart rate of the last six hours in a curved line. HUAWEI WATCH 2 also measures your Resting Heart Rate, which is recorded in the activity monitor app. The HUAWEI WATCH 2 has a classical wristwatch design that integrates its smart features and sport functions while maintaining a stylish look. Made from sophisticated materials, a dual crown design delivers a premium feel. While honouring the classics, the watch is adaptable to the wearer’s personality, with both classical and sporty design options. The high-definition display is customisable with multiple face designs, allowing users quick access to their favourite and most frequently used apps. In addition to a chronograph design, HUAWEI WATCH 2 features a ceramic bezel that provides a fine quality while offering a comfortable wearing experience. The watch is also designed for comfort and fit during exercise, meaning it is curved to sit perfectly against the wrist. It is smaller and more compact than the previous generation HUAWEI Watch with its parts on one side accounting for 88% of the total area of the watch. With a new smart OS and intuitive controls, the HUAWEI WATCH 2 is a personal assistant that brings convenience without infringing on daily life. Running on the new Android Wear 2.0, the on-watch Google Play Store allows both iOS and Android users to benefit from a vast library of compatible applications. Touch control, intelligent speech recognition and voice instructions enable users to quickly interact with the HUAWEI WATCH 2 and reply to complex messages. The Android PayTM* app and NFC technology allows for convenient and secure payments. The battery is smarter too thanks to an optimized battery with greater density and longer life. The battery lasts for up to two days with regular use, up to 10 hours in “training mode” and up to three weeks in “watch mode”. Technology innovator Huawei and premium lifestyle brand Porsche Design extend their partnership with the announcement of the new Porsche Design HUAWEI Smartwatch. Complementing the Porsche Design HUAWEI Mate 9, which was launched in November 2016, the product further enriches the user experience. Again, the collaboration brings together the latest innovations in technology with the most functional design, creating an equilibrium of aesthetics and function. It combines the latest activity tracking and fitness management functions with the connectivity and smart technology of a leading smart wearable device. For those who demand style and substance, the Porsche Design HUAWEI Smartwatch delivers professional standard fitness tracking, the latest smart functions and sophisticated design – all from the wrist. The innovative smart watch is the first ever to be created by Porsche Design and part of a continuous roll out of smart devices, which will be released in the upcoming months. Richard Yu, CEO of Huawei Consumer Business Group said of the launch: “In today’s fragmented information age, the real function of technology is to provide convenience and connectivity without intruding on your daily life. We wanted to make a product that suits those individuals who wish to explore the limits of their own expression, while still being bound by a need to stay connected. With this product there is no need to stay glued to your smartphone. The independent connectivity and smart applications that can be used from your wrist mean you can go for a run or a cycle and leave your phone behind with the freedom of knowing you won’t miss an important message.